Built in 1947 for Ben Franklin store, it has been converted into several smaller spaces – currently occupied by Meco7, The Valley Troll, Amy Winter photography, Hearing Connect, and Bernie’s Book Keeping and Tax Preparations. First Building in Glenwood. Built in 1866. Photo from 1876. 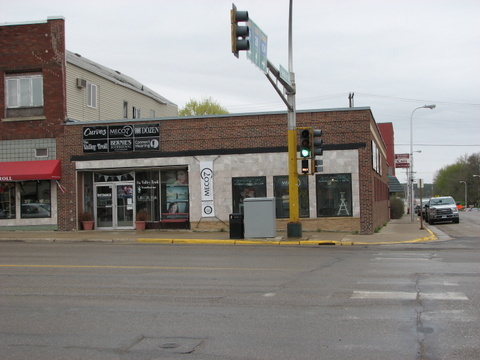 The first building in Glenwood was built on this site. 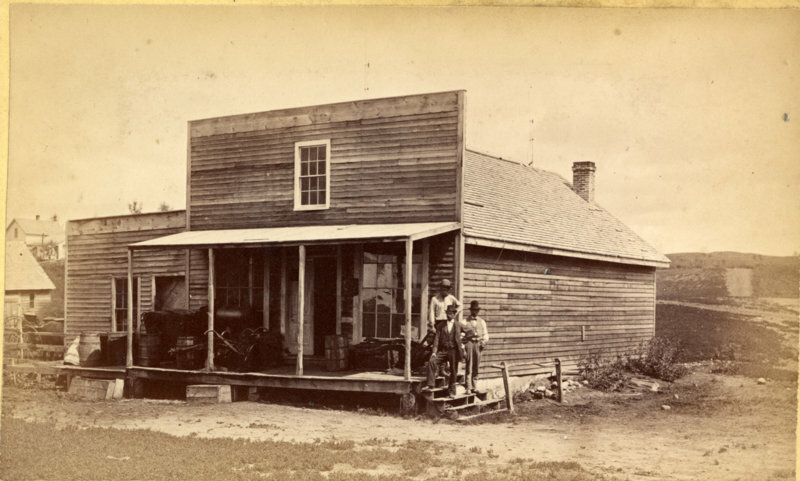 It started as the “Kinney and Lathrop store building”, used by Sam Johnston for a general store until purchased by the Wollan Brothers., who formed the “Fremad Association” (Fremad means “forward”). According to the Wollan family files, it was purchased in 1872 by Michael and Casper Wollan, but they moved to a new location in 1874 as the Fremad Association expanded. It operated as the Peterson and Stensing Hardware Store in 1876, when Alexandria Photographer N.J Trenham photographed Glenwood. Joseph Furtney either completely renovated the building or tore it down to build another large, 2 story building on this site between 1918-1920. Attorney Joe McNitt purchased the building in 1937 and converted the “Uptown Ballroom” on the second floor into apartments. That building was destroyed by fire in 1942. Businesses in the building at the time: Klug’s Café in the basement where the fire started, Corner Drug Store, Baum’s Barber Shop, The Northern State Power office, and Flaten’s Fashionette. 5 apartments and several offices upstairs were also destroyed. Ben Franklin Building. Built in 1947. This entry was posted in Local History and tagged Amy Winter Photography, Baum’s Barber Shop, Ben Franklin, Bernie's Bookkeeping, Corner Drug, Corner Drug Store, Flaten’s Fashionette, Fremad Association, Furtney Building, Glenwood 150, Glenwood Drugstore, Glenwood Minnesota, Joe McNitt, Joseph Furtney, Kinney and Lathrop store, Klug’s Café, Mecco7, Myron Hardware, Northern State Power, Peterson and Stensing Hardware Store, Pope County, Pope County 150, Pope County Historical Society, Pope County History, Pope County Minnesota, Pope County Museum, Reeves Law Office, Sam Johnston, Uptown Ballroom, Valley troll. Bookmark the permalink.